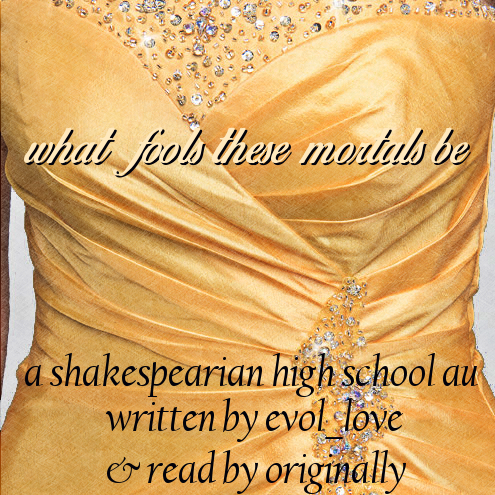 Author's summary: Various shenanigans of various Shakespeare characters when prom season arrives at their high school. Inspired by What Fools These Mortals Be by evol_love. See original for author's notes. As a content note, there's a homophobic slur in here, although it's not aimed at anyone and is in the context of the use of such words being wrong. This story was recorded as part of Amplificathon 2014. So, er... well, this week was the bard's birthday, so naturally the right choice to commemorate that is to record a massively cracky high-school AU. (I also recorded a performance of a Lady Macbeth monologue if you want something more serious). I actually think he would approve of this kind of thing, since the majority of what good Will did himself was essentially AU fanfiction, and this story is just the right mix of funny, bawdy and serious. I haven't podficced a lot of funny stuff, so I do hope I have actually managed to capture the humour here! Enjoy my fond pageant.